Gas prices are up across the nation due to Hurricane Isaac, but Ohio and its neighboring states are suffering from the worst increase, not the Gulf states. Click on photo to find the price in your state. Bill Moore was as surprised as his customers when a gallon of gas at his Steubenville, Ohio, station shot up 16 cents Tuesday. But he wasn't surprised by the reaction. "They're irate. They're complaining bad," said Moore. "I don't know what to tell them. It's going up for me as well." The reason for the spike was something not apparent on a sunny day in Ohio -- Hurricane Isaac, battering the Gulf Coast more than 1,000 miles away. Preparations for the storm meant oil platforms and pipelines in the Gulf region were shut, cutting off the normal flow of oil to refineries in the Midwest. A gallon of regular climbed to $3.95 a gallon from $3.79 at Moore's station. That scenario was common throughout Ohio. AAA's state-by-state estimate of gas prices Wednesday showed the state had the biggest one-day jump in the nation -- a 13.9 cent increase to $3.878 a gallon. Neighboring Great Lakes states suffered similar spikes -- a 13.2 cent rise in Indiana and a 12 cent rise in Michigan. By comparison, Gulf states' gas prices were up about 4 or 5 cents, while the national average gas price rose 4.8 cents. Drivers in the Midwest were scrambling to deal with the spike. Anna Daugherty of Lansing, Mich., was at work Tuesday morning when she heard about the price increases. She ran out at lunch to fill up before all the cheaper gas was gone. "The moment I walked up to the register to give [the cashier] my money, he said I got there in the nick of time, as they were just about to change the price," she said. The price at that station jumped to $4.09 from $3.79. Moore says his customers are cutting back on their purchases, buying only a few gallons instead of filling up. That's probably a pretty good strategy, since prices are expected to retreat quickly. Fred Rozell, retail pricing director for Oil Price Information Service, which tracks prices for AAA, said market conditions in the Midwest traditionally make it one of the more volatile regions of the country for gas prices. "They tend to really move whenever there's an event," he said. "It's not uncommon to see prices in the Great Lakes states jump 20 cents or fall 20 cents in a day." Rozell expects prices to return to pre-storm levels by the end of this week, once oil starts flowing through the pipelines again. 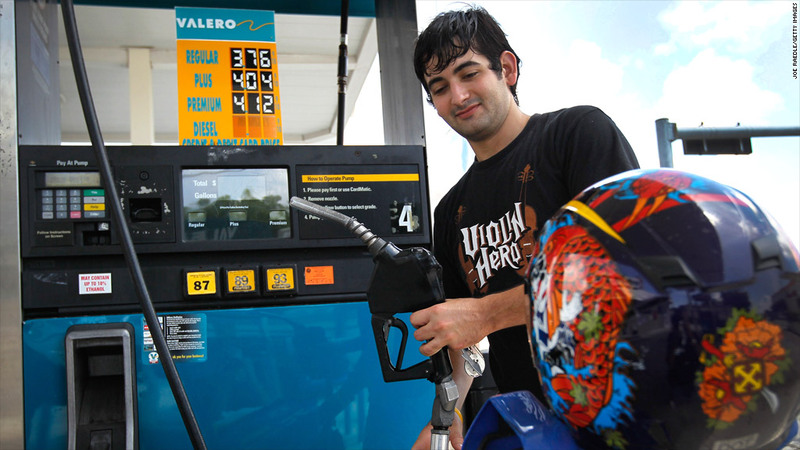 Next month, prices should fall further when refineries no longer have to make more expensive summer blends of gas. By the end of September, he expects the national average will be under $3.50 a gallon, down from $3.804 Wednesday. But right now, gas is in short supply -- and prices high -- in the Midwest. Habib Shah, director of marketing for Ohio Petroleum, trade group for independent station operators, said some of his members can't even get the gas they need and have had to shut temporarily. Others are paying 20 cents more per gallon. "They were having problems," he said. "Especially if they're in competition with the big chains, they're having a tough time."